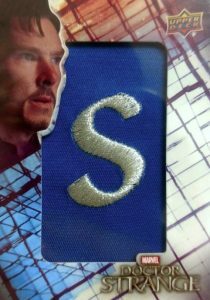 2016 Upper Deck Doctor Strange takes a non-traditional approach to the Marvel movie with seven one-card packs per box. Each hobby box promises one hit from a group that includes sketch cards, autographs and premium inserts, as well as two memorabilia cards. Much more limited than the regular entertainment sets from UD, every card showcases quality stock. 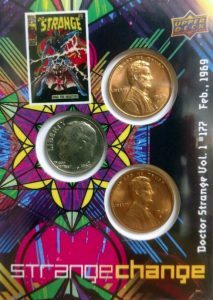 2016 Upper Deck Doctor Strange works with a 50-card base set, numbered to just 150, along two hobby-only LTFX parallels: Silver (#/50) and Gold (#/25). 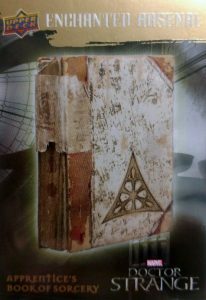 Premium options in 2016 Upper Deck Doctor Strange drop one per box and include Actor Autographs, Sketch Cards or one of four inserts, like Book of Cagliostro Booklets with specific background info for main subjects, limited to less than 100 copies. The autographs signers include Dr. 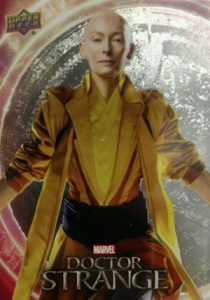 Strange himself, Benedict Cumberbatch, as well as Tilda Swinton as The Ancient One. 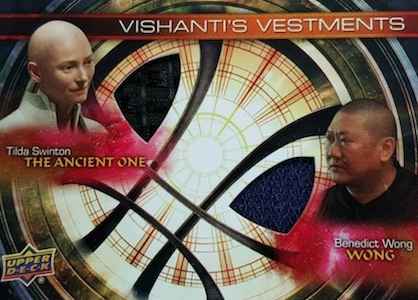 Averaging two per box, Memorabilia cards display relic pieces from actual items used in the production of the movie. One of the relics in each box will be a multi-piece card. There are also comic-inspired Strange Change with legal tender that corresponds to the original cost of the comic book in question. Limited signed versions add a Stan Lee autograph. 2016 Upper Deck Doctor Strange also has an extensive ePack offering. 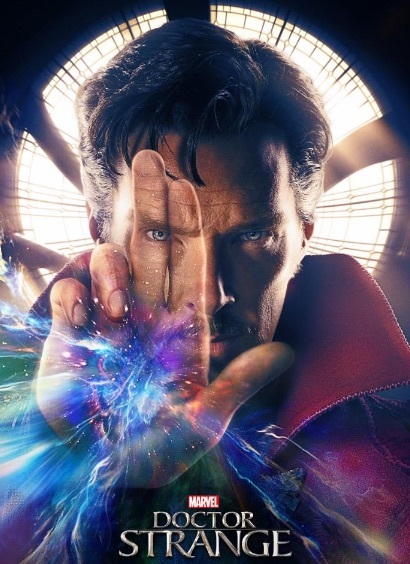 Other collectibles for the Marvel film include a line of Funko Pop Doctor Strange figures. 50 cards. Serial numbered #/150. Hobby only. Hobby PARALLEL CARDS: Silver LTFX #/50, Gold LTFX #/25. 10 cards. Serial numbered #/50. Hobby only. Hobby PARALLEL CARDS: Silver LTFX #/12, Gold LTFX #/5. 7 cards. 1:14 packs. Hobby only. 20 cards. Serial numbered #/49. Hobby only. 10 cards. Serial numbered #/99. Hobby only. 4 subjects. 1:60 Hobby packs, 1:80 ePack. Each subject has individual letters that spell out "DOCTOR STRANGE." 18 cards. 1:42 Hobby packs, 1:368 ePack. SM-6 The End at Last! SM-12 Dr. Strange Meets... Death! 10 cards. 1:7 packs. Hobby only. 11 cards. 1:9.33 packs. Hobby only. 11 cards. 1:28 packs. Hobby only. 2 cards. 1:176 packs. Hobby only. 63 artists. 1:14 Hobby packs, 1:252 ePack. The following cards are exclusive to ePack. ePack PARALLEL CARDS: Silver Foil (1 per 20 base), Rainbow Foil (1 per 5 achievement). 42 cards. 1:80 packs (#AP-1 Doctor is 1:240).